You may think that as a vegan or vegetarian, sushi is off the menu. Fear not, you won't arrive to snack on edamame while everyone else indulges, there are options for us too! 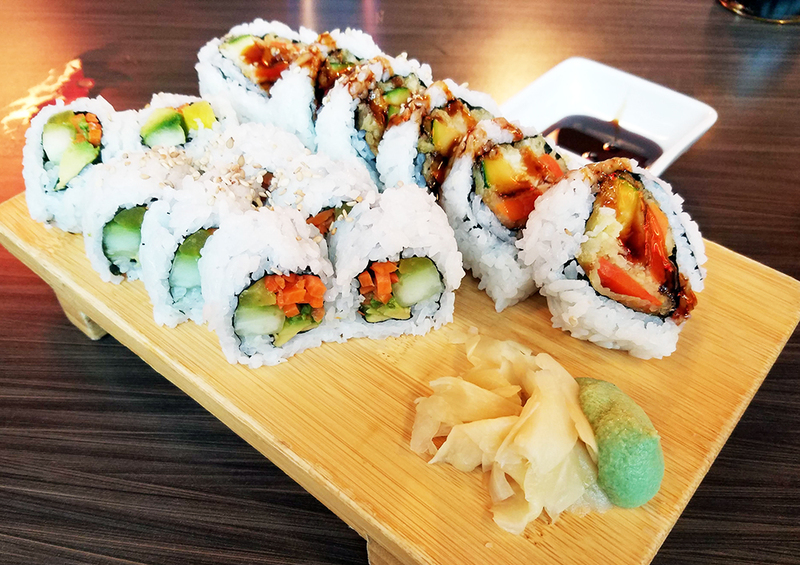 Some sushi places offer various maki rolls filled with fresh vegetables, avocado and even tempura options. 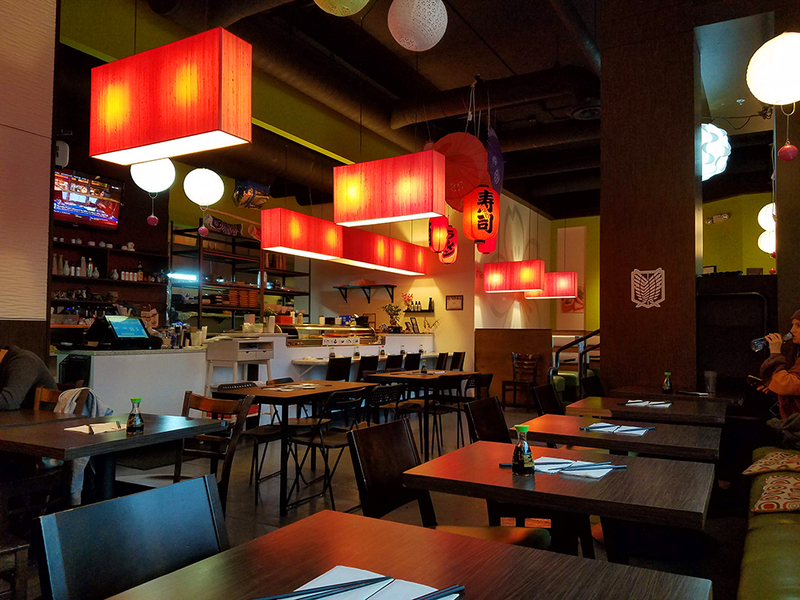 Mio Sushi offers a handful of vegan and vegetarian choices, from tofu to tempura vegetables, giving you some fine choices. 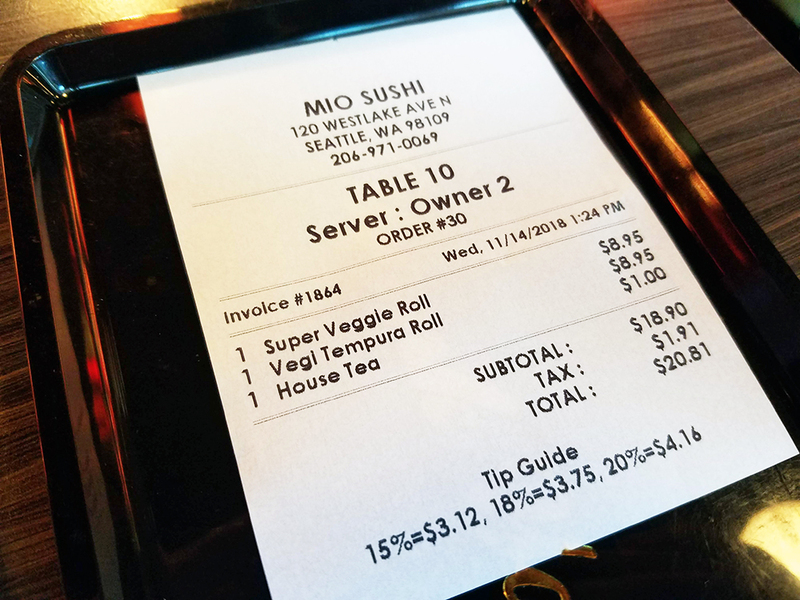 Prices here for these vegan options are around $8 per maki roll, reasonable for downtown Seattle, especially in South Lake Union where prices tend to be a bit higher. 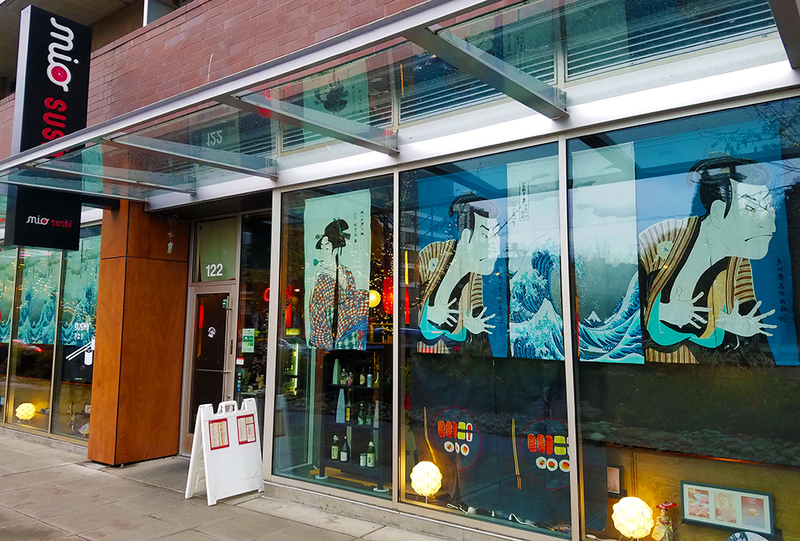 Walk in off Westlake and step down into this hip sushi restaurant. They have a very small counter or plenty of tables and half booths along a wall of windows. The staff is friendly and will seat you wherever you prefer. I originally opted for the counter but it felt narrow and I didn't like my back facing the door so I moved to a half booth without any issue (at lunch hour this may be more difficult as it can get quite busy but if you come around 1:30 - 2 PM as I did, it's relatively quiet with only a few late lunchers). Maki, Temaki, Nigiri or Sashimi? When ordering at a sushi restaurant or counter, it is best to go in understanding the four basic types of sushi. These include maki, temaki, nigiri and sashimi. Maki sushi - from "maku", means "to wrap/roll" and is wrapped in seaweed ("nori"), with or without rice on the outside. for the obvious reason of wrapping it in seaweed. Temaki is typically cone shaped and eaten by hand, similar to a burrito. This is a variation of maki, temaki means "hand-rolled". These two types of sushi are the most common to have options for vegan and vegetarians. Nigiri sushi, what many think of when they hear sushi, is a block of vinegar sticky rice acting as a base for either raw or cooked fish to sit atop, sometimes you may find nigiri with vegetables, such as cucumber, but it is not as common. Nigiri comes from "nigiru" which means "to grasp/grip" and can be eaten by hand or with chopsticks gripping the rice, either method is appropriate. Sashimi meaning "sliced body" is nigiri without the rice. I ordered hot tea, one Super Veggie Roll (cucumber, avocado, asparagus, oshinko "Japanese pickle", sesame) and the Vegi Tempura (carrot, asparagus, sweet potato, sweet sauce, sesame). The tea arrived promptly in a generous portion, it had a pleasant and mild flavor. When the food arrived, it was presented on a wood board with Gari "pickled ginger thinly sliced" and wasabi. The wasabi was a bit weird looking, more like a wasabi blend as it had a whipped texture that I am not used to seeing but mixed with low-sodium soy sauce I didn't notice much difference. The Super Veggie Roll looked consistent throughout and were good sizes that fit in your mouth easily. I felt like it had a nice crunch but not a whole lot of strong flavors, it was approaching bland and okay overall, not something I would order again. The Vegi Tempura was sliced thinner and was a bit bigger in circumference, which looked like it may be difficult to eat. I ended up trying to bite through the first piece to break it in half only to make a huge mess. The second go, I put the whole piece in my mouth flat and seemed to manage just fine - definitely how it was meant to be eaten. This was a true delight, the hot tempura sweet potato was delicious! Truly something unique and with the sweet soy sauce on top, it really brought alive the sweetness from the carrot as well. The asparagus gave the roll a lovely crunch, just what it needed to balance the sweet side of things and mix up the texture profile. This sweet potato tempura is worth a return trip and I would definitely come back just for it, so good and a must try! The hot tea was satisfying and for $1 per cup, worth a try if you enjoy a cup of tea with your sushi. The bill with tax was $20.81 which is a bit expensive for the cost of lunch but not uncommon in South Lake Union. I didn't like how their bill is presented with recommendations for tipping, which is calculated post-tax. You may not know, the standard is to tip based on the pre-tax total as tax has nothing to do with the service or goods received. I am sure many people use these numbers just to make it easier on themselves during a busy work day but it doesn't feel like a good practice. Small plate. Quick Bites. Healthy Options. Next: Next post: What happens if I quit social media for a month?